Many options to choose from. Give them a try and you will see great results on your hair. Depending with the length of your hair, you may need to adjust the quantity of ingredients. You can also substitute ingredients. Have fun mixing and let me know how they work on your hair. This is one of the most popular DIY deep conditioners. It repairs damaged hair and is great for the overall strength of your hair. Mix all ingredients in a blender until smooth. If the mixture is too thick add more olive oil or coconut oil. After you wash your hair, apply the mixture generously to hair. Then cover your hair with a plastic cap. Leave it in for 30 minutes under a hooded dryer. De-tangle and rinse thoroughly. Style as usual. Warm olive oil in a microwave for about 20 seconds. Add honey and mix well. Apply to damp hair and cover with a plastic cap for 15-30 minutes. Rinse well and style as usual. Great for hair that is very dry to give it hydration. Mix all ingredients in a blender until smooth. Wash and apply mixture to hair. Cover your hair with a plastic cap. Leave it in for 30 minutes under a hooded dryer. Detangle and rinse thoroughly. Style hair as usual. Mix all ingredients well until smooth. Apply to washed hair and leave it in for 30 minutes under a hooded dryer, detangle then rinse thoroughly. You can add honey and avocado to the recipe for even more moisture. Mix all Ingredients well in a blender until smooth. Apply to washed hair. Cover hair with a plastic cap and sit under a hooded dryer for 30 minutes. Detangle and rinse thoroughly. Its a simple conditioner that very moisturizing for dry hair. Minus the banana, it makes a great pre poo treatment. Great DIY especially for the winter months to keep your hair super soft and moisturized. Mix all ingredients together in a blender until smooth. Apply to washed hair. Cover hair with a plastic cap and sit under a hooded dryer for 30 minutes. Detangle and rinse thoroughly. So there you have it. 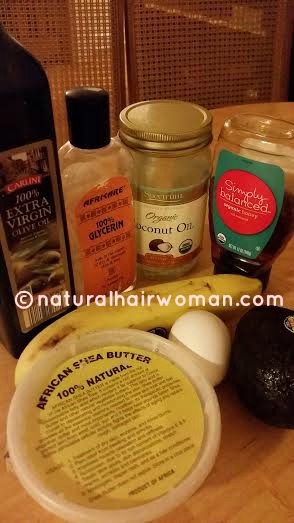 My 6 favorite homemade deep conditioners. Your hair will thank you! What’s Your Favorite Homemade Deep Conditioner? I’d love to hear from you in the comments below.